My other half is originally from Hat Yai so every now and then I find myself visiting this southern Thai city, like I did last month for Thai New Year (Songkran). On this trip I decided to fly via Kuala Lumpur and take Air Asia. I booked online for a great price and showed up at the Low Cost Carrier Terminal with my pre-printed web check-in boarding passes. I had baggage to check-in so fronted up to one of the counters and handed over my passport and my bag. Fortunately there was not much of a queue so the process was fast. My passport was checked, bag tagged and my printed boarding pass stamped to confirm my documents had been verified. Next it was upstairs to passport control and through security. Once through security there is a small selection of duty free shops and food outlets in the LCCT. There is also free wi-fi. This was to be my last time using this terminal as KLIA 2 is opening in May which will see a huge upgrade to the facilities. I sat on a spare seat and made use of the wi-fi to surf the net and check Facebook. After about 30 minutes boarding was called and the usual mad rush of passengers crowded the gate area, eager to get going. It's a long walk across the tarmac to the aircraft at the LCCT, there is no airbridge's here. We were directed to a new Airbus A320 fitted with sharklets and as I had pre-selected row 6, I boarded through the forward stairs. The aircraft was just 3 months old and in great condition. The flight was quite full and we ended up leaving about 15 minutes behind schedule. The safety demo was broadcast in both Malay and English during the short taxi to the runway. The flight was short but we climbed up to 32,000 feet and it was quite a smooth ride for most of the way. I had pre-purchased a hot meal when I made the booking, it is very good value really (less than 10 ringgit). The meals are delivered to your seat and you need to show your boarding pass as confirmation. You may also purchase additional drinks or snacks if you wish. I bought a coke to go with my satay chicken. As it was a short flight we were already on descent when I had finished the meal. We made an approach over some nearby hills before turning to line up with the runway. It was actually quite gusty in Hat Yai so there was a bit of turbulence but it was a smooth landing. On the way to the terminal I spotted a Thai Lion Air Boeing 737-900ER about to push back and head to Bangkok. They are a fairly new carrier in Thailand but I am a little hesitant to try them out due to the record of their Indonesian parent airline. Hat Yai only has 2 international arrivals per day (one from Singapore and this flight from Kuala Lumpur) so there is not many immigration desks. 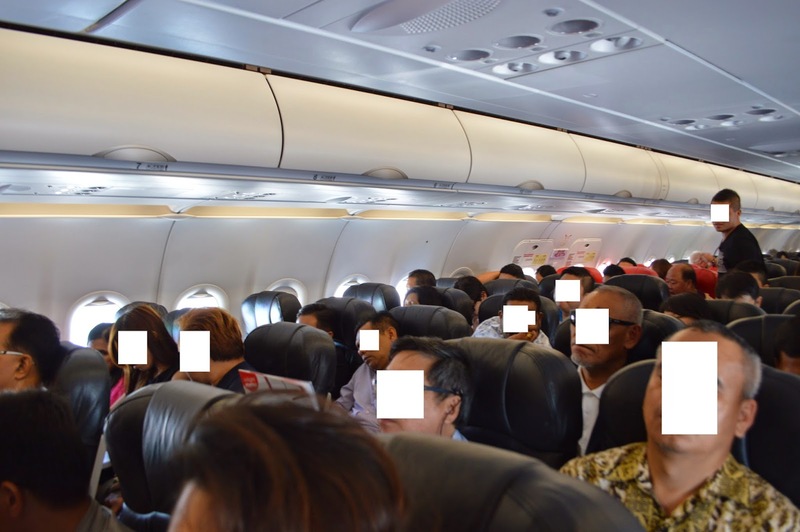 IT is a good idea to try and sit at the front of the aircraft if you don't want to be faced with a large queue. Since I was only in row 6 I was through quickly and before the bags had hit the belt. Overall it was a decent flight with Air Asia. I paid a low price but received a relatively good service with a decent hot meal. The flight was on a brand new aircraft and ran only about 15 minutes behind schedule. The main drawback with Air Asia in K.L is the terribly over crowded Low Cost Carrier Terminal (LCCT) but since that is about to become a thing of the past I will look at flying with them more often in the future from the new KLIA 2 terminal. I'm a huge fan of Air Asia and their meals! Like you, not so much of a fan of Lion Air though! Are you going to post a report on the flight to KUL ? Would be interested to read that also. Is that part of Thailand safe? I thought DFAT advice was to avoid the Malaysian bordering provinces. Yep. It now says do not travel. Air Asia do a much better service than Thai or Malaysian. For less than $3 AUD you gan get a great meal. When thai give you water, juice and a squished roll. Great job Air Asia.